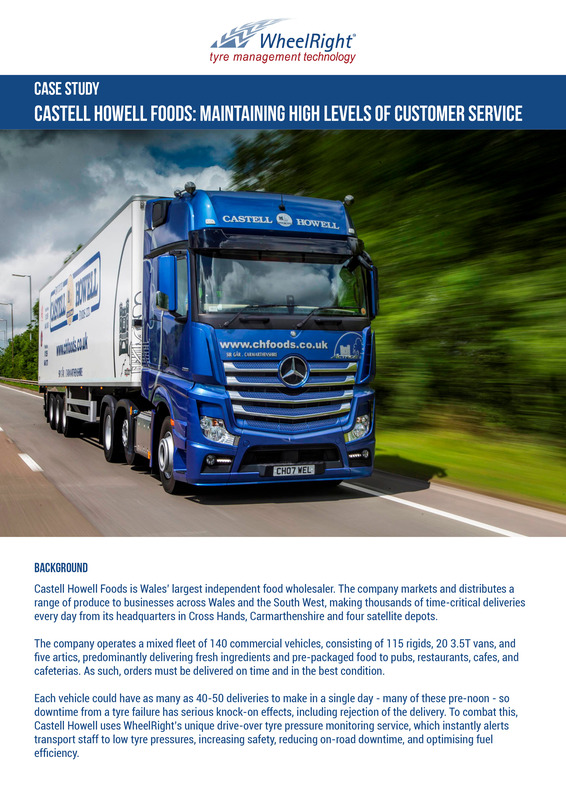 Castell Howell Foods is Wales’ largest independent food wholesaler. The company markets and distributes a range of produce to businesses across Wales and the South West, making thousands of time-critical deliveries every day from its headquarters in Cross Hands, Carmarthenshire and four satellite depots. The company operates a mixed fleet of 140 commercial vehicles, consisting of 115 rigids, 20 3.5T vans, and five artics, predominantly delivering fresh ingredients and pre-packaged food to pubs, restaurants, cafes, and cafeterias. As such, orders must be delivered on time and in the best condition. Each vehicle could have as many as 40-50 deliveries to make in a single day – many of these pre-noon – so downtime from a tyre failure has serious knock-on effects, including rejection of the delivery. To combat this, Castell Howell uses WheelRight’s unique drive-over tyre pressure monitoring service, which instantly alerts transport staff to low tyre pressures, increasing safety, reducing on-road downtime, and optimising fuel efficiency.